A for assassin in Seeker, by Arwen Elys Dayton (book review) – higher purpose or highest bidder? You can endure tough training for a good cause. You can sacrifice personal ease for a higher purpose. But what if it’s all a lie? Quin’s shock at discovering that she and Shinobu have been honed into elite assassins instead of justice-seekers is matched by John’s fury at being denied that same life – the birthright that brought them together will separate them forever. But John isn’t so ready to let the ancient artifacts slip away from him, craving the power of travel through space-time that Seekers use. 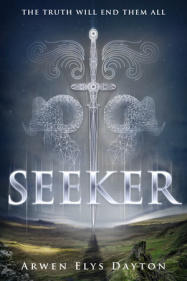 Book info: Seeker / Arwen Elys Dayton. Delacorte Press, 2015. [author site] [publisher site] Review copy and cover image courtesy of the publisher. My book talk: Trained in deadly martial arts since childhood to become a peace-Seeker like her stern father, Quin finds instead that she’s blood-bound into life as an assassin – unless she and her training partners can find a way to break free. Family heritage and ancient artifacts allow Seekers to travel through time and space, but few apprentices train in the wilds of Scotland now. Shinobu lost his Japanese mother to an accident, John saw his mother vanish into thin air, and Quin’s mother tries not to hear the 3 teens’ mental grumbling about how hard Briac and Alistair work them. When the Dreads arrive from somewhere in time to administer the Seeker oath, Quin and Shinobu learn the truth about their heritage and gift, while John has been cast out. Brutal attack on the stronghold, leaping across the world to Hong Kong, strange messages from unexpected sources – can the Seeker way be turned back to peace or must they remain assassins for the highest bidder forever? ← Almost AtoZ Challenge time! this book sounds fascinating. I may not comment often, but I love seeing all the different books you blog about. Looks like an interesting book and I enjoyed your book talk. Thanks! Thanks for visiting, y’all! A super line-up of YA books in several genres for April (and always), so c’mon back!